Wedderburn is a rural township on the Calder Highway, 70 km north-west of Bendigo. It was founded on a gold field, one of the most north-westerly gold sites from Melbourne. It’s nearest neighbouring towns are St Arnaud (also a former gold town) and Charlton. Gold was first discovered at Wedderburn in 1852. The field was first known as Korong or Mount Korong. The mount, 12 km south-east of Wedderburn, is the tallest feature in the area. It was climbed by the New South Wales Surveyor-General, Thomas Mitchell, during his Australia Felix expedition in 1836. ‘Korong’ is thought to be derived from an Aboriginal word meaning campsite, large swamp or canoe. The origin of Wedderburn’s name is slightly more confused. The most likely explanation is that a William Wedderburn served in the goldfields Mounted Police. 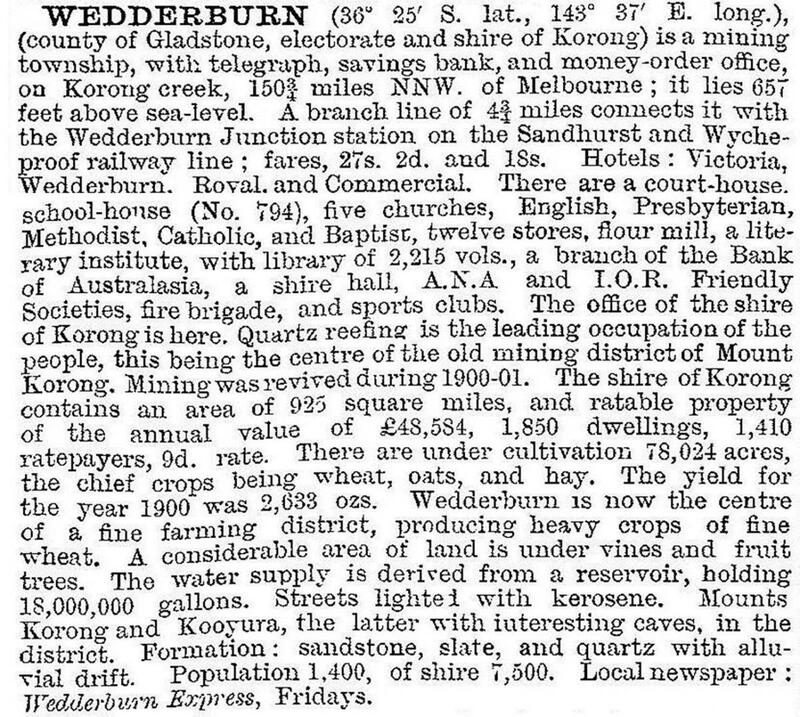 Wedderburn township was surveyed in 1856-57 and allotment sales began in 1858. There had been a hotel (1853), a Methodist chapel (1857) and several stores at the time of the survey. Gold was obtained from numerous alluvial gullies, and the number and size of nuggets drew many miners. Between about 1855 and the 1890s quartz reefs were worked, and steadily out-produced the alluvial sites. In 1862 the Kingower and Wedderburne Road District was proclaimed, in turn becoming Korong shire on 6 September 1864. Wedderburn has been the administrative centre of the shire throughout its existence. The Korong Miners’ Literary Institute was established in 1859, a national school was opened in 1861 and the present Anglican church building was constructed in 1866. By then Wedderburn also had three hotels and a court house, and some parts of the goldfield were described as being worked out (Bailliere’s Victorian gazetteer, 1865). Farm selections were taken up in the 1870s, and the district’s rainfall was suitable for wheat. A flour mill was opened in 1880, becoming a major local employer until destroyed by fire in 1919. Two years after the mill was opened the railway line was extended from Inglewood with a station at Wedderburn Junction, 8 km east of Wedderburn. A spur line between the two Wedderburns was opened in 1887. Water for town use was sometimes endangered by dry spells. The reservoir was improved in 1915 and a second storage at Skinners Flat, north of the township, was completed in 1928. Despite the precariousness of water, some notable private gardens and public reserves have been established. North of Wedderburn there are several areas of State forest, including the Wychitella flora and fauna reserves. The forests have supported eucalyptus-oil distilleries, although the area has been subordinate to Inglewood for the production of eucalyptus oil. Wedderburn’s most famous personality was Albert Jacka, VC, MC and Bar, who attended the local school and enlisted for World War I from Wedderburn. His portrait adorned the shire council chambers, and the town’s war memorial is of more than usual grandeur. The Korong Historical Society was established in 1967, and has a museum in a former store in High Street. The occasional discovery of gold nuggets, as recently as the 1970s quite close to the town, has added to the town’s sense of history. There is a rumoured reef under the school. The literary institute, shire hall (1874), Methodist and Anglican churches (1866) and Church of Christ (1872) are among several surviving early buildings. Wedderburn has a golf course, two public reserves, (the larger containing swimming, tennis, bowling, harness racing and trotting facilities), four churches, a hotel, a motel and a caravan park, a community health service (in place of the bush nursing hospital established in 1938), and the P-12 Wedderburn college which replaced the primary school and a high school (1961). In addition to the Wychitella reserves there is the Mount Korong scenic reserve. The railway line from Wedderburn Junction was closed in 1986, but the Junction’s station building is on the Victorian Heritage Register. Wedderburn is the administrative centre of Loddon shire, into which Korong shire was absorbed in 1995. A grant was received in 2012 to turn the community centre into a major local hub with a new service desk for the Wedderburn neighbourhood house, a tourism stand and a tourism information centre. The Loddon Council rezoned land for a small housing estate in Wedderburn in 2013 on land purchased with the support of the Wedderburn Development Association.